Friday, November 22, 2013 at 6:00 p.m.
Large selection of U.S. coins, currency, medals and stamps removed solely from estates, old collections and private households. 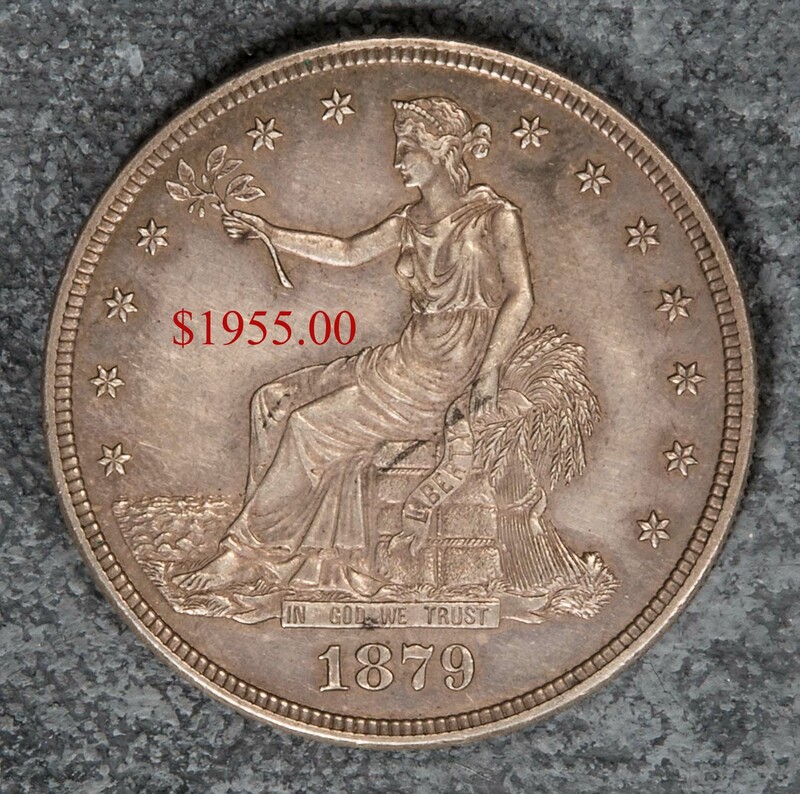 Type coins to include 1869 3 cent silver and 1879 Trade Dollar. 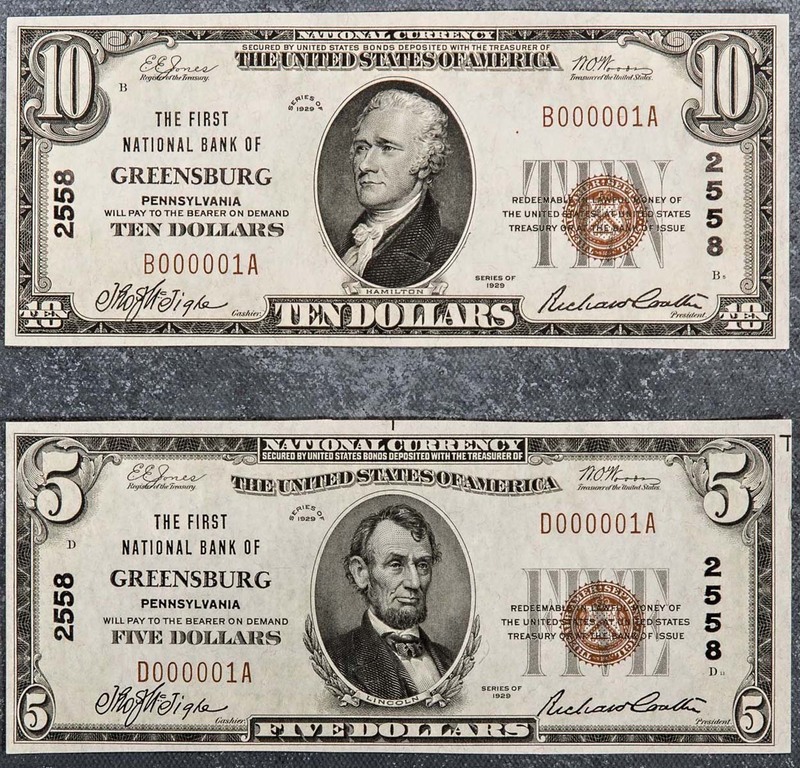 Nationals to include Greensburg, PA 1929 $5 and $10 Number 1. 1902 Issue $5 plain back from People’s National Bank of Waterville (ME). Many modern U.S. Mint sets, proof sets and state quarters. U.S. and World gold to include English proof Sovereigns. Medals include F.N. Mitchell Mass. Mechanical Association. General selection of U.S. and World stamps. 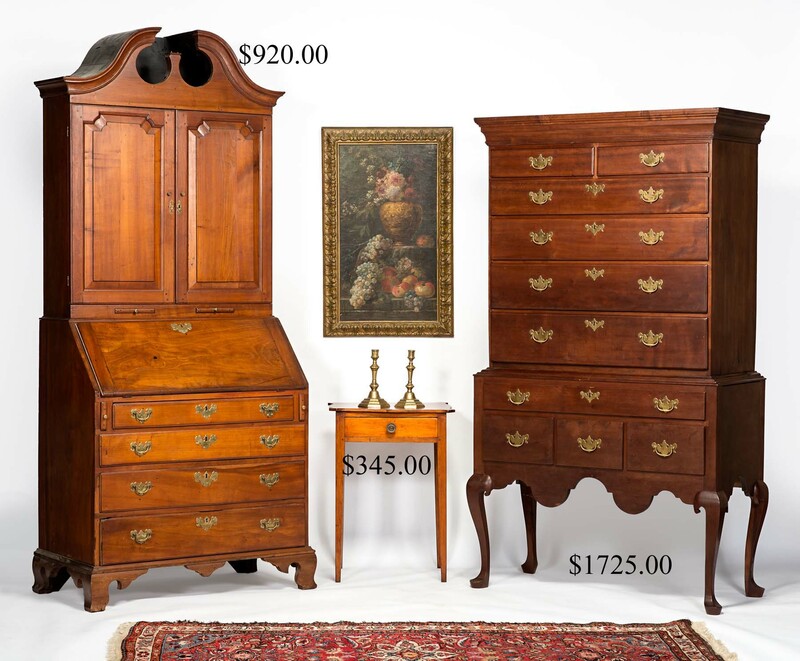 Saturday November 23, 2013 at 10:00 a.m.
ESTATE FURNITURE: 86 X 36 cherry secretary desk having descended through the family of George Ffrost, member of the First Continental Congress. 84 in. 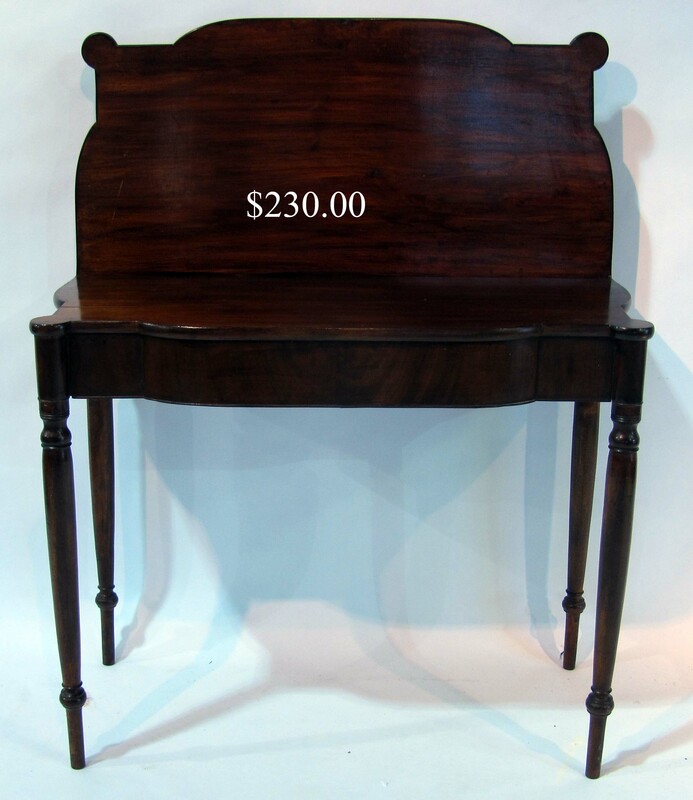 18th c. Queen Anne flat top cherry highboy on cabriole legs. Inlaid 40 in. bowfront graduated four drawer chest on high French feet. 41 in. bracket base maple graduated four drawer chest. Reeded leg N.E. Federal mahogany card table with paneled and string inlay. 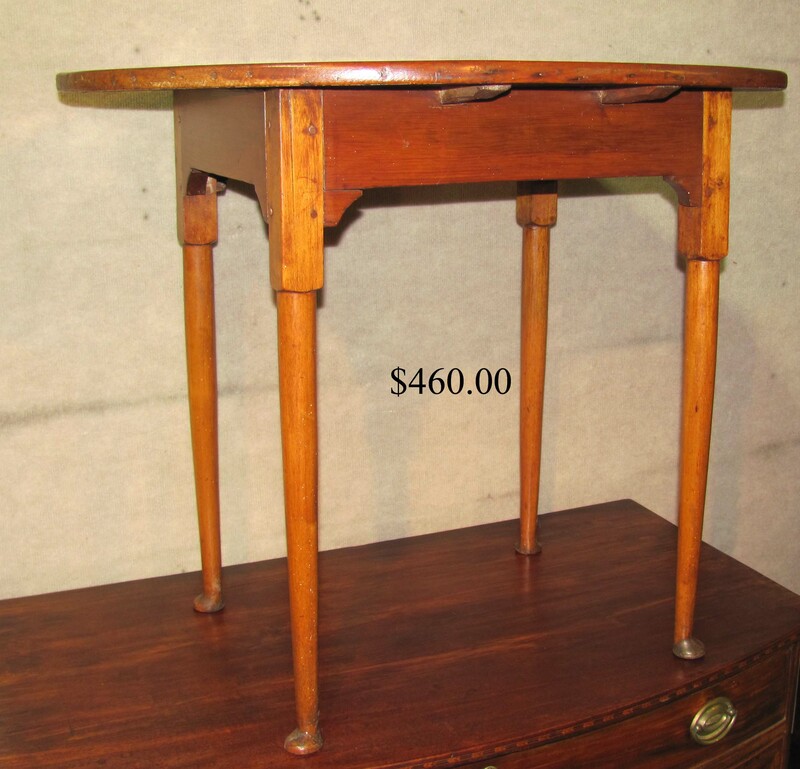 19th c. turned leg mahogany card table with turret corners. 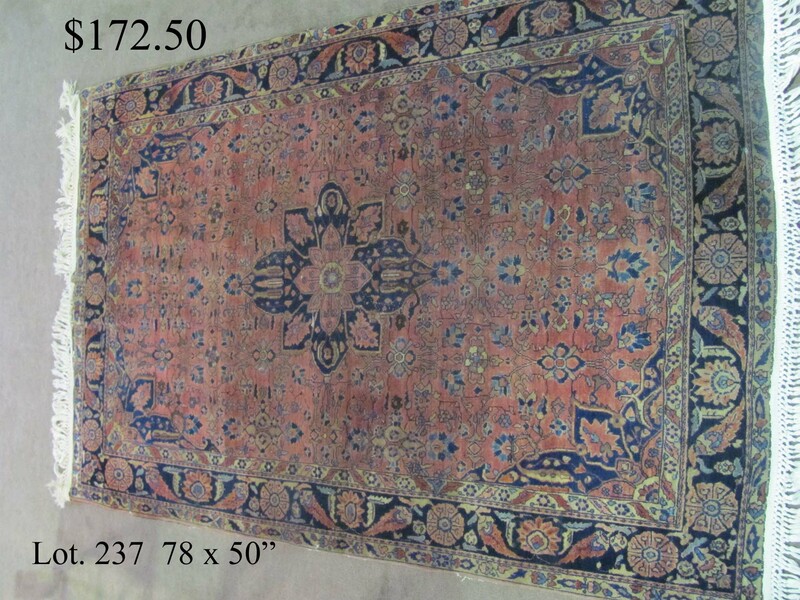 19th c. 41 in. tiger maple drop leaf table on cabriole legs and pad feet. 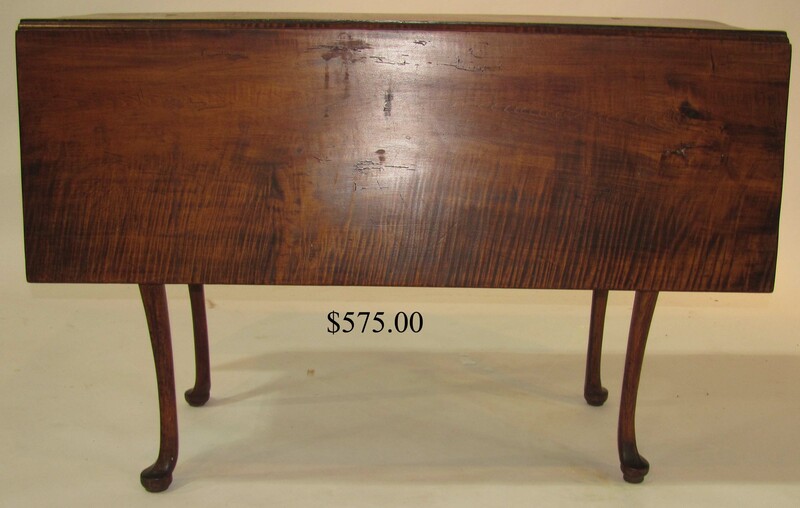 33 X 19 cross-stretcher cherry drop leaf table and others. 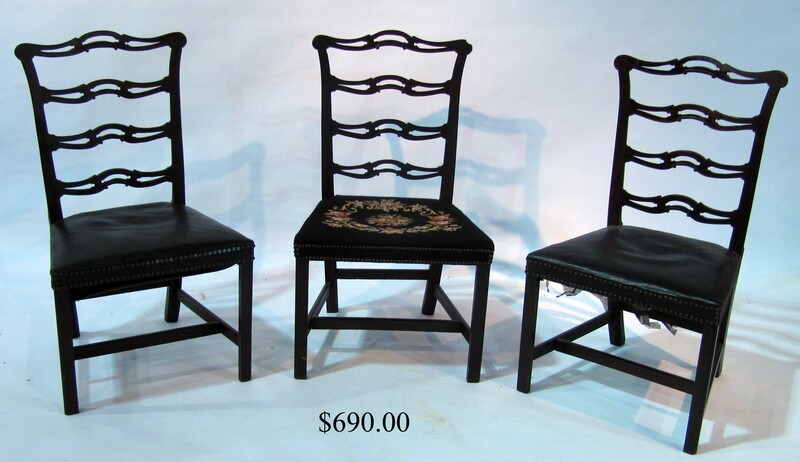 Set of three Chippendale mahogany ribbonback side chairs and selection of Queen Anne side chairs. 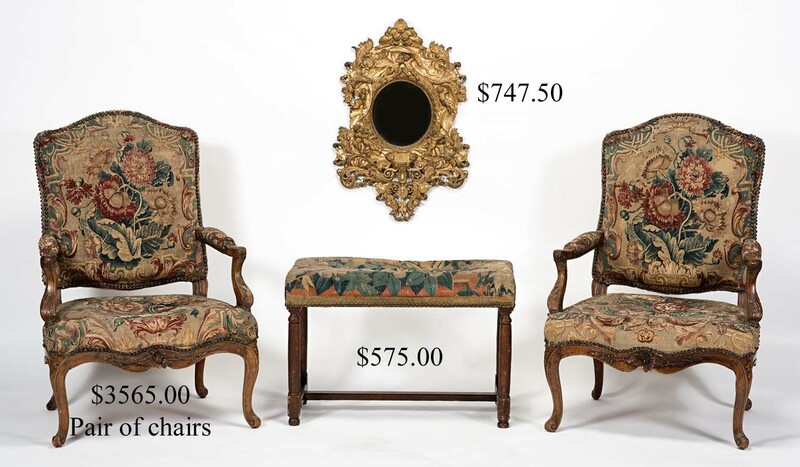 Pair of 18th c. carved and tapestry-upholstered armchairs and 18th c. tapestry bench. 18th c. 31 X 21 highly carved giltwood mirror with putti and scrollwork. Other good mirrors. 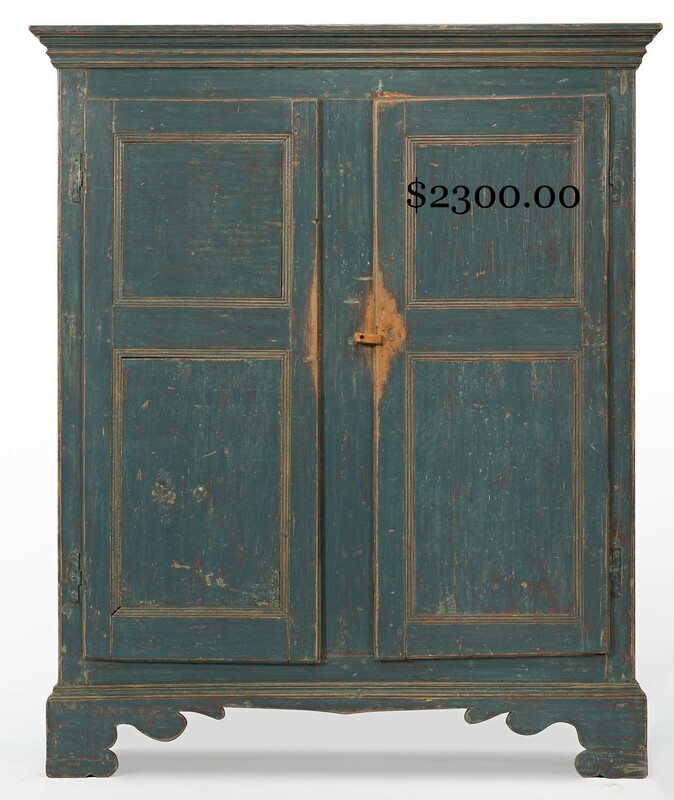 Striking old blue 18th c. two door cupboard on fancy bracket base. 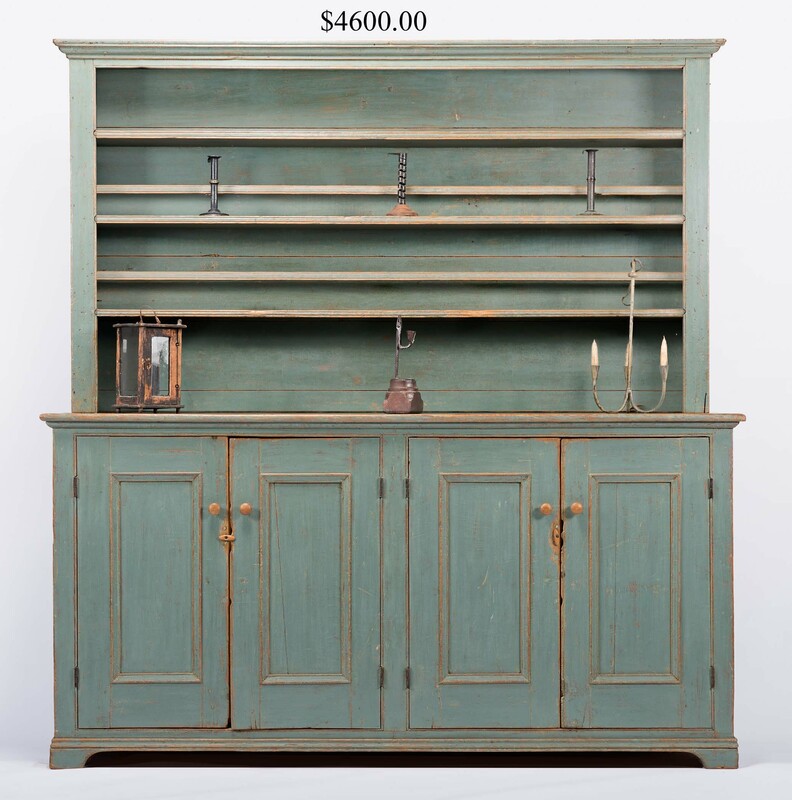 Early 19th c. 84 X 80 X 19 two piece open top stepback cupboard in old blue paint. 36 in. graduated four drawer chest in old dry red paint on high bracket base. 71 X 41 X 14 old red and blue stepback open top pine cupboard over three drawers and raised panel door. 33 X 26 in. 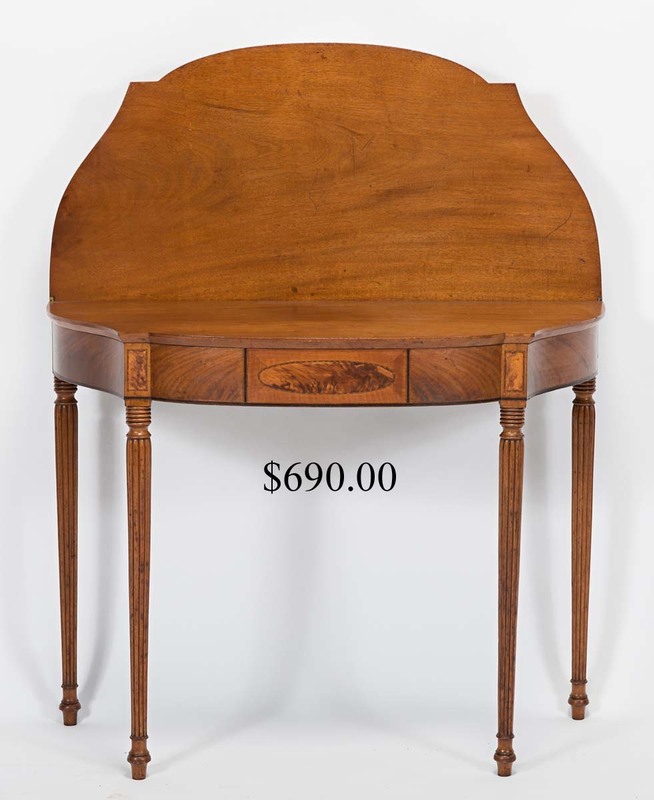 oval Queen Anne tea table on diminutive pad feet. 49 X 26 in. stretcher base one drawer tavern table. 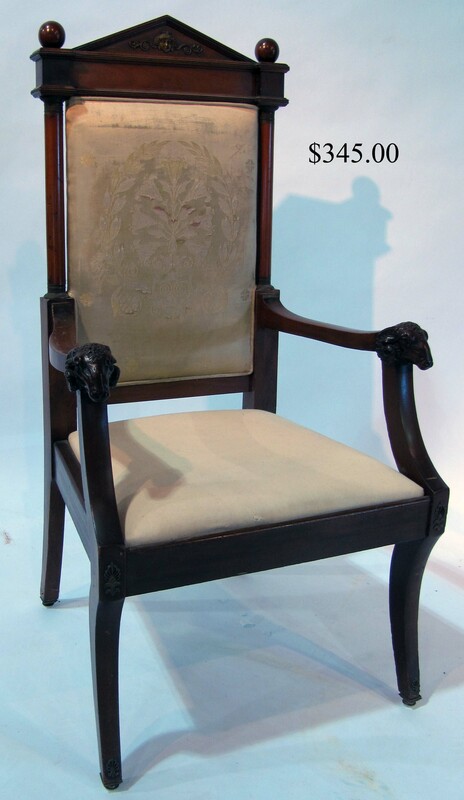 19th c. ladderback buggy seat. 18th and 19th c. blanket and storage boxes. 39 X 27 in. 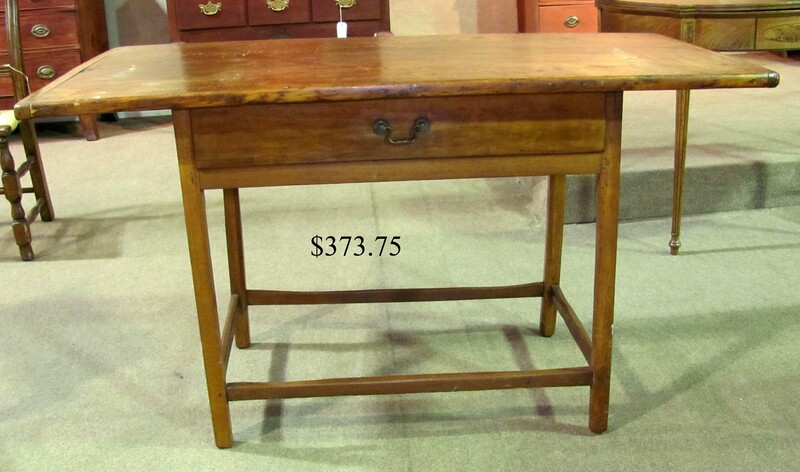 half-round old red tapered leg pine work table. 72 in. turned leg harvest table in natural finish. 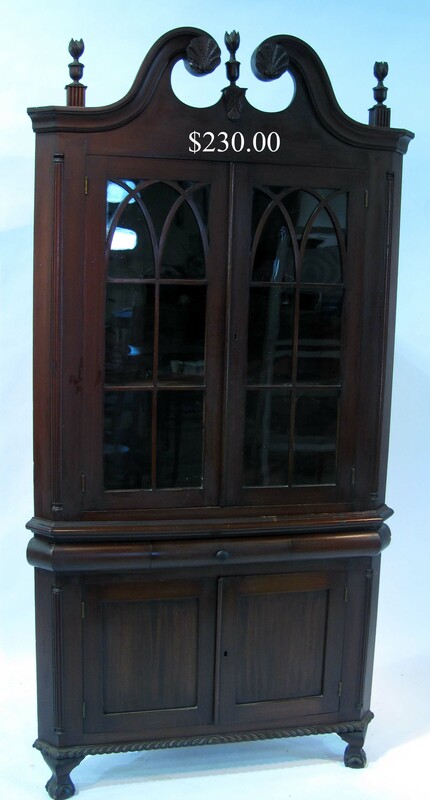 Late 19th c. mahogany corner cupboard with glazed Gothic arch doors and good carved detail. Shaped top one drawer maple and pine stand. 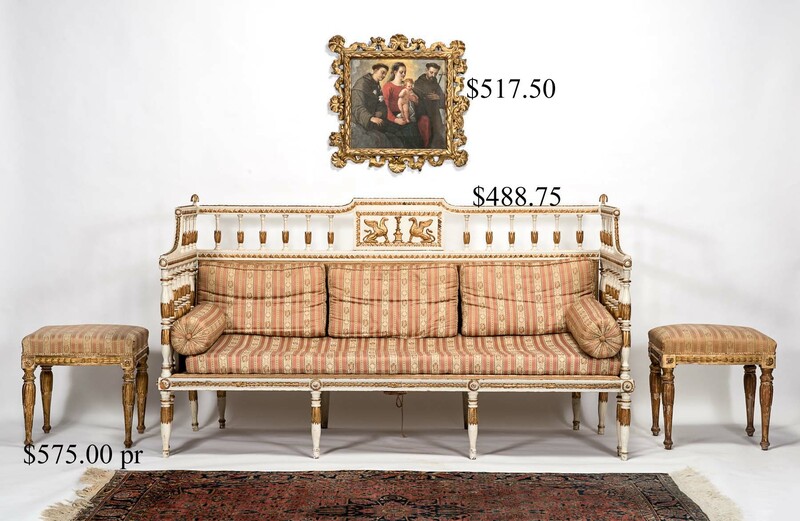 Distinctive Gustavian highback sofa, descended through local old Swedish family, having painted and gilded spindlework. Compatible pair of upholstered ottomans and set of six dining chairs, including two armchairs. 38 and 19 in. tall marble inlaid Asian carved rosewood plantstands. 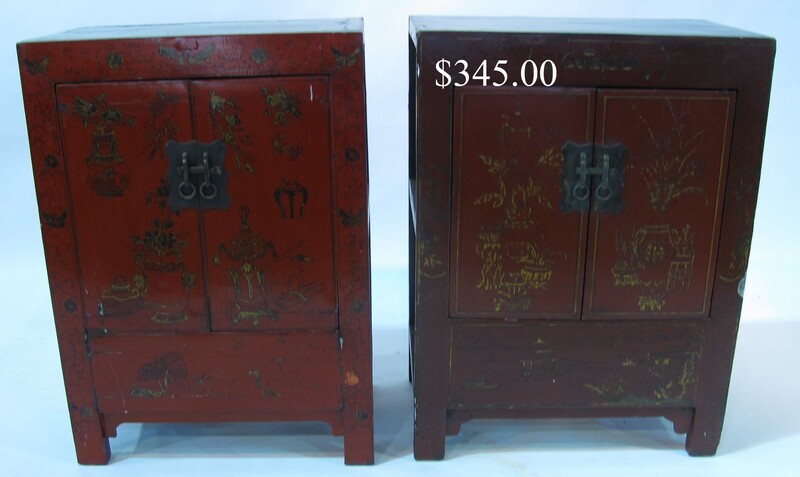 Pair of small Asian lacquered cabinets. 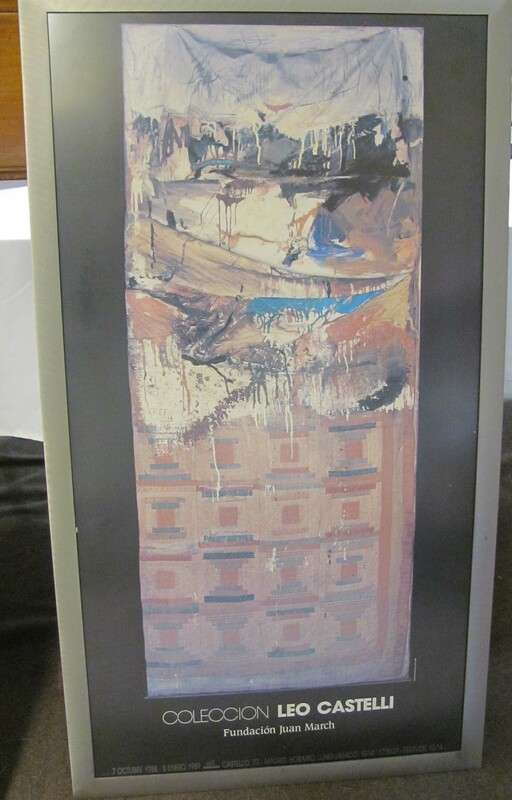 Unusual 12 X 5 ft. architectural panel of decorative spindle work. 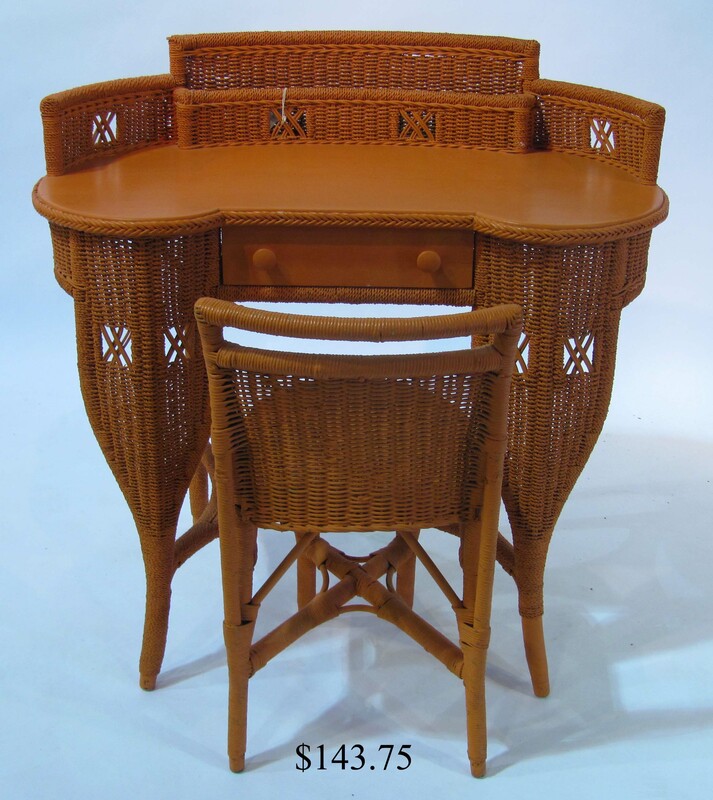 Distinctive kidney-shaped wicker writing desk and chair in old salmon paint. Rare 65 in. 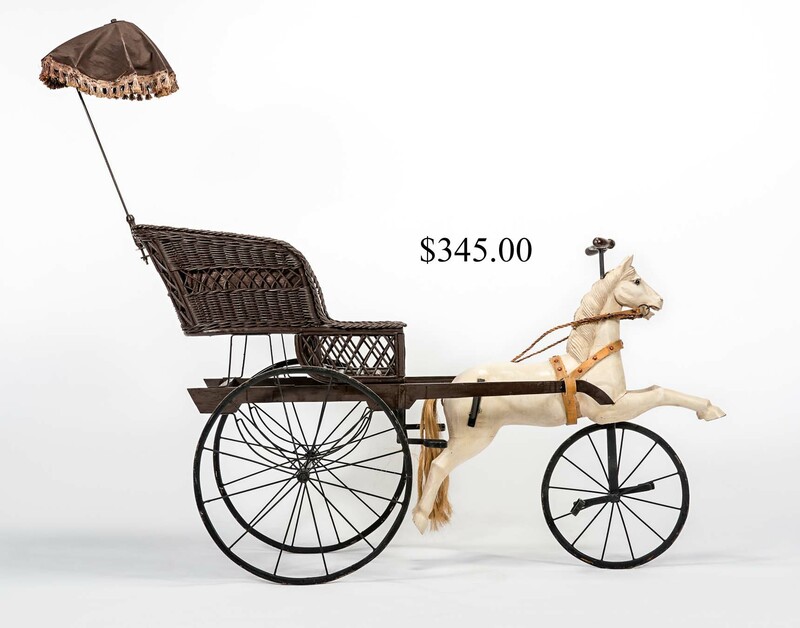 19th c. wicker-seated velocipede with nicely carved ornamental horse. 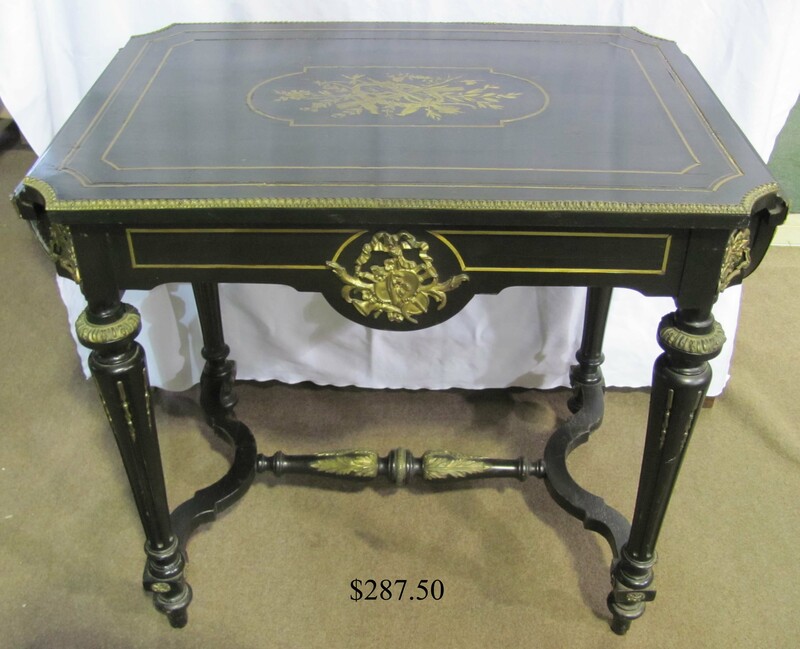 AESTHETIC FURNITURE: including ebonized 30 X 22 occasional table with brass ormolu decoration, trim and inlay and high back upholstered armchair with carved rams’ heads and figural brass trim. 20TH CENTURY: Mies Van Der Rohe 40 in. square glass top Barcelona table. 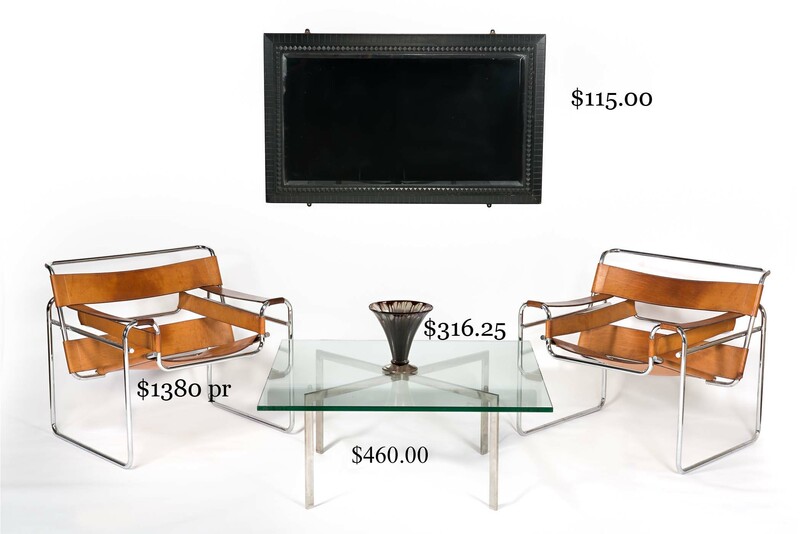 Pair of Marcel Breuer designed Wassily leather armchairs. 53 in. diameter Theodore Waddell designed glass top dining table. 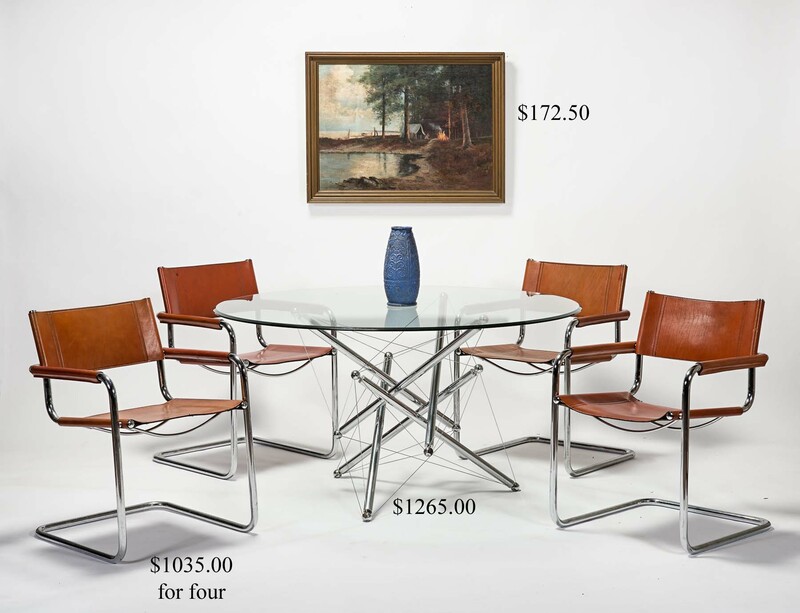 Four Mies Van Der Rohe influenced leather armchairs. CLOCKS AND INSTRUMENTS: 92 in. 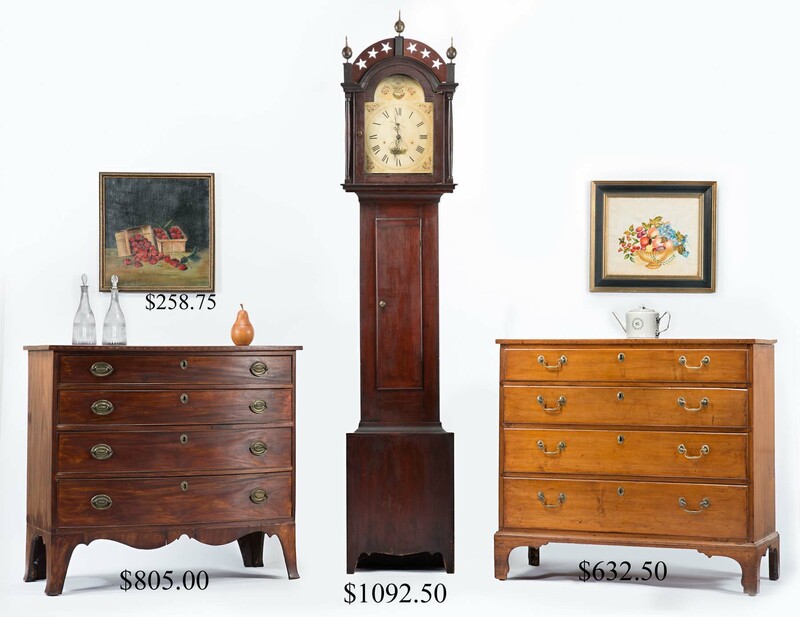 Silas Hoadley tall case clock with star-pierced crest. Eli & Samuel Terry 31 in. pillar and scroll shelf clock. 10 in. brass-framed French bracket clock. 36 in. 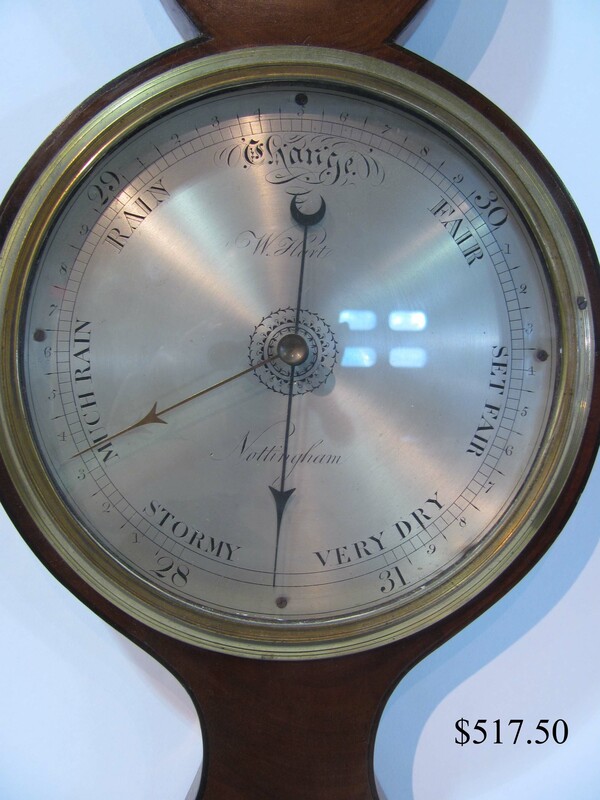 W. Hart, Liverpool, wall barometer (detail). Cameron, Liverpool, sextant in case. J. W. Ray, Liverpool, spy glass and others. W. H. Harling, London, chart instrument. 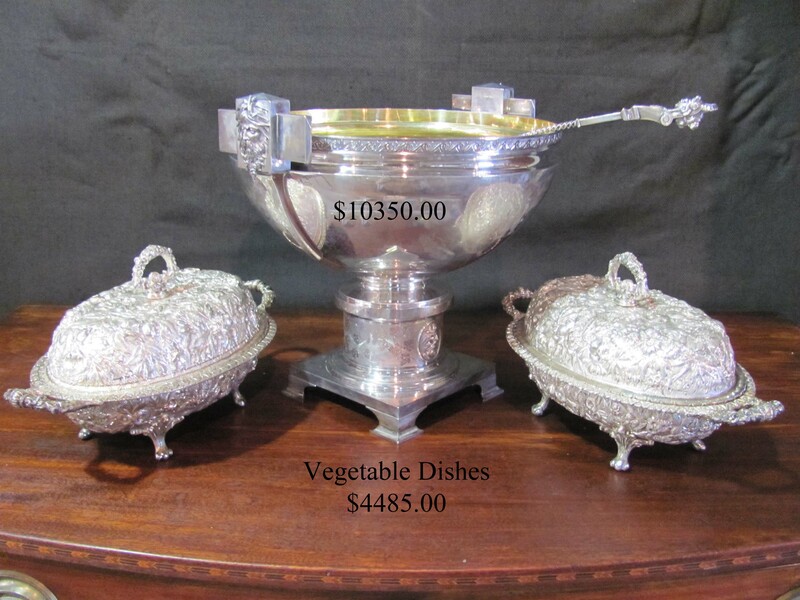 ESTATE SILVER AND JEWELRY: Selection of good sterling hollow ware, flatware and serving pieces. Large Starr & Marcus punch bowl and ladle. Early Kirk vegetables. Selection of early Swedish silver. Coin silver. Silver-plated ware and table candelabra. Small selection of gold, sterling and costume jewelry. 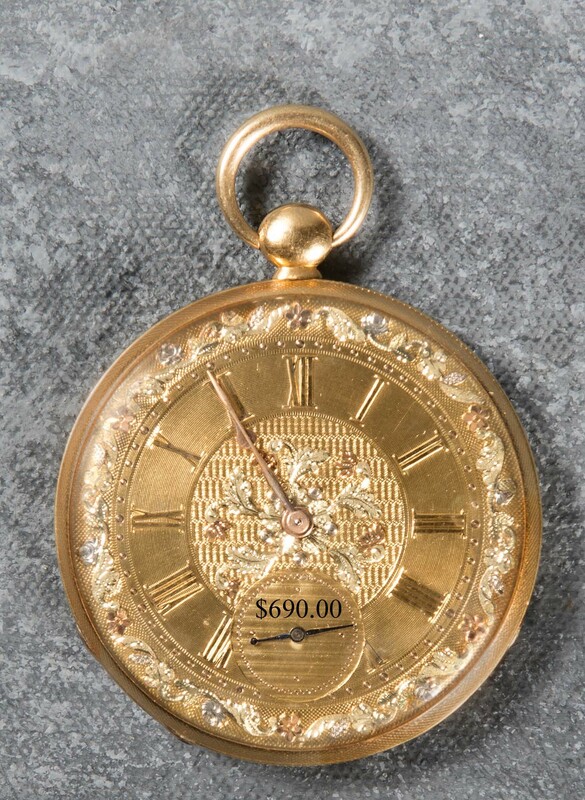 18k decorated case man’s pocket watch. ESTATE CHINA, POTTERY AND GLASSWARE: 19th c. Asian tableware. Strawberry tea china. 18th c. cross-handled decorated teapot and tankard. Pr. 12 in. white Staffordshire dogs. Sevres, Royal Copenhagen, Cauldon and other table china. Pottery includes Dedham, Rookwood and other misc. art pottery. Large and colorful single owner collection of Gouda, Swedish, Danish, Belgian and German art pottery. Light blue 12 in. dogwood Majolica water pitcher. D. G. Carpenter mocha. Banded yellow ware. Decorated stoneware jugs and crocks. Rare Great Falls, NH jug. Selection of various old bottles in deep and lighter green. Early etched decanters and blown wines. Unmarked 8 in. pheasant eye decorated green art glass vase. OLD LIGHTING: Singles and pairs of 18th and 19th c. brass and iron candlesticks, including wedding band hogscrapers. Early 63 in. standing wrought iron two light candlestand on tripod base. Early wrought iron three light hanging candle fixture. 18th c. wrought rush light on wood mount. Adjustable wood screw table candlestand. Wood frame candle lantern. Hanging iron miner’s lamp with bird mount. Onion and other hand lanterns and lamps. Tin and wood hanging candle boxes. B.B.B. student lamp. Glasgow port lantern. Pair of Telford, et. al. lanterns and others. Bors a Cahors oversized carriage lantern. Very fancy C. 1910 wrought iron three light floor lamp with wrought floral mounts. 6 in. decorated Quezal light shade. Crystal chandelier with candle cups. OLD BASKETS, WOODENWARE AND METALWARE: Selection of better form gathering, feather and swing handle baskets. Coil baskets. Small round and oval utility boxes, including 5 ½ in. oval old blue Harvard box. 10 in. diam. old red covered pail. Old blue and lignum vitae mortar and pestles. Early wooden kitchen utensils, butter prints, firkins and measures. Souvenir canoes. 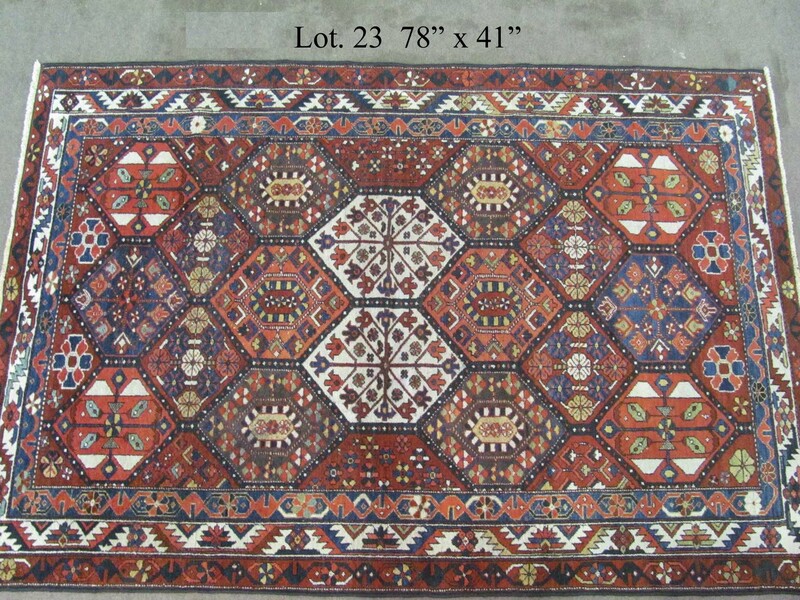 19th c. 10 in. sq. pine game board. 18th c. curled end ice skates with acorn tips. Collection of approx. 400 19th c. wood and wire pie lifters thought to have been made locally but never sold by the maker. Early and complete 27 in. tin reflector oven. Group of small decorated toleware boxes and spouted pieces. Early kitchen tin and copper ware. Long-handled coal pans. Fireplace footed and other iron buckets. 24 in. 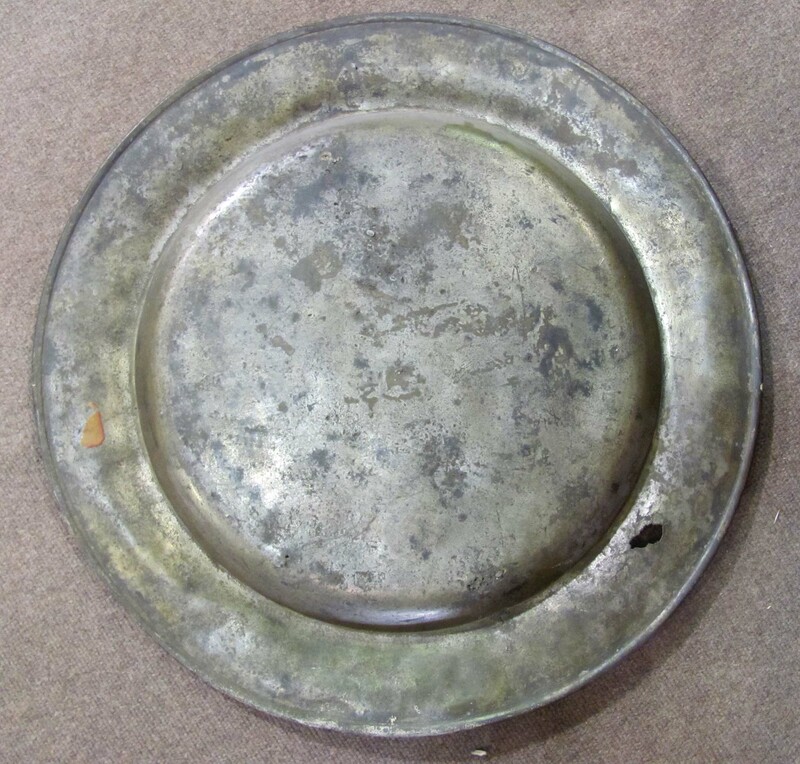 pewter charger (side 1, 2) belonging to WILLIAM AND MARGERY PEPPERRELL, PARENTS OF SIR WILLIAM PEPPERRELL, 1696-1759. and descending though the Newcastle and Durham Ffrosts to the present family member. 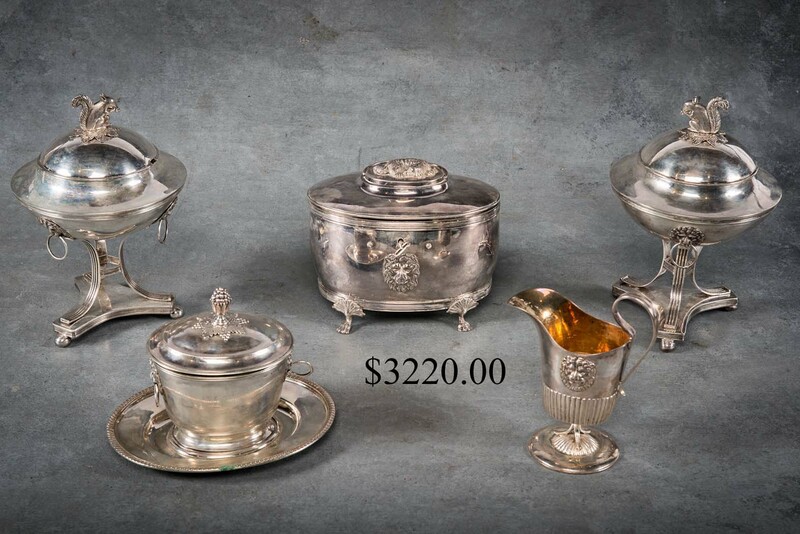 Other pewter, including large Dixon coffee pot, various size plates, measures and hollow-ware. 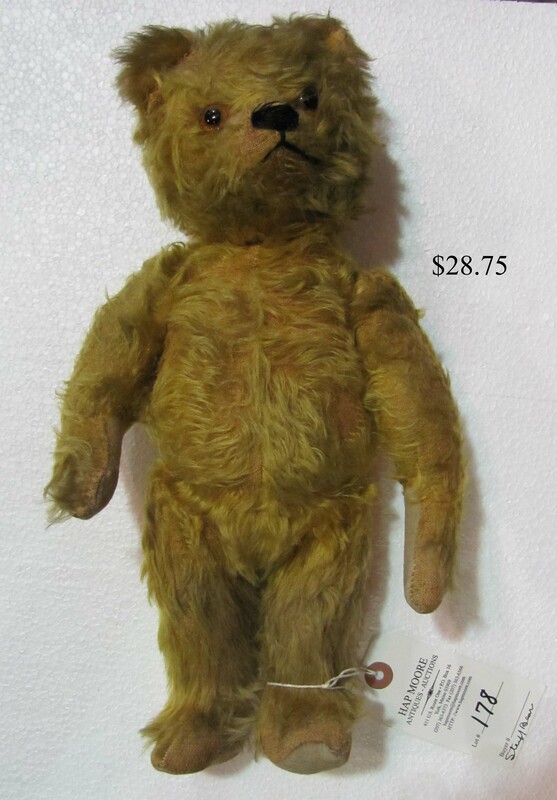 OLD TOYS AND DOLLS: 32 in. Keystone Water Tower fire truck. 30 in. Buddy “L” fire truck. 24 in. 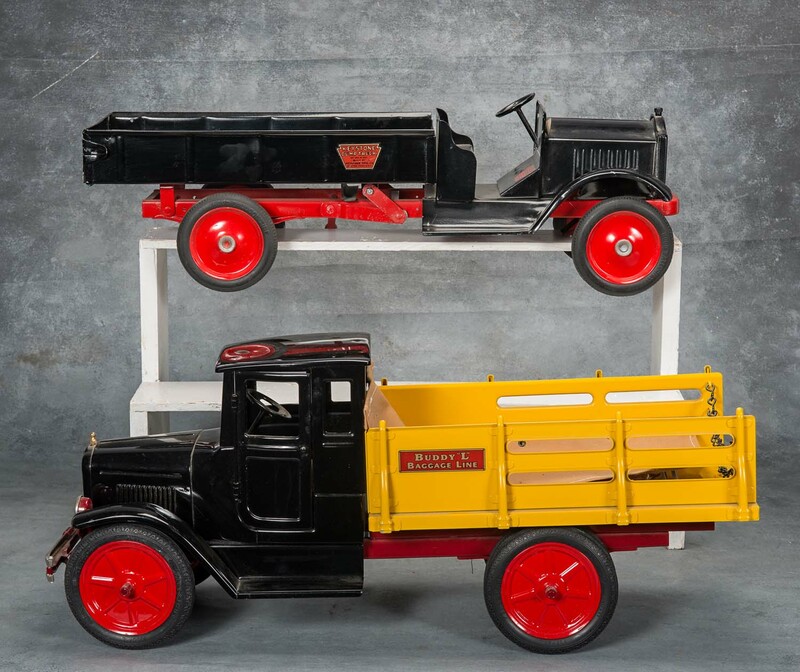 Buddy “L” dump truck and more, some restored. Wolverine crane No. 20. Penny toys. 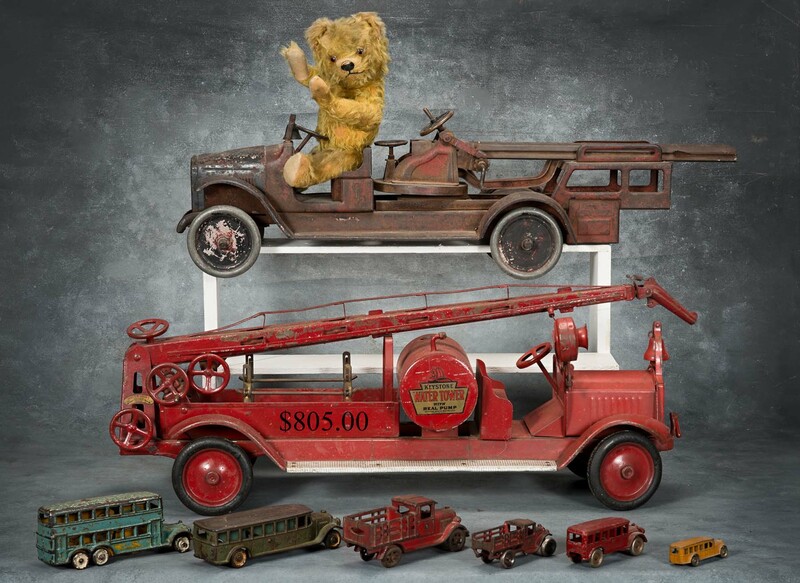 Cast iron toy busses and other vehicles. Cast iron still banks. Cast Royal and Eagle toy stoves and accessories. 13 in. 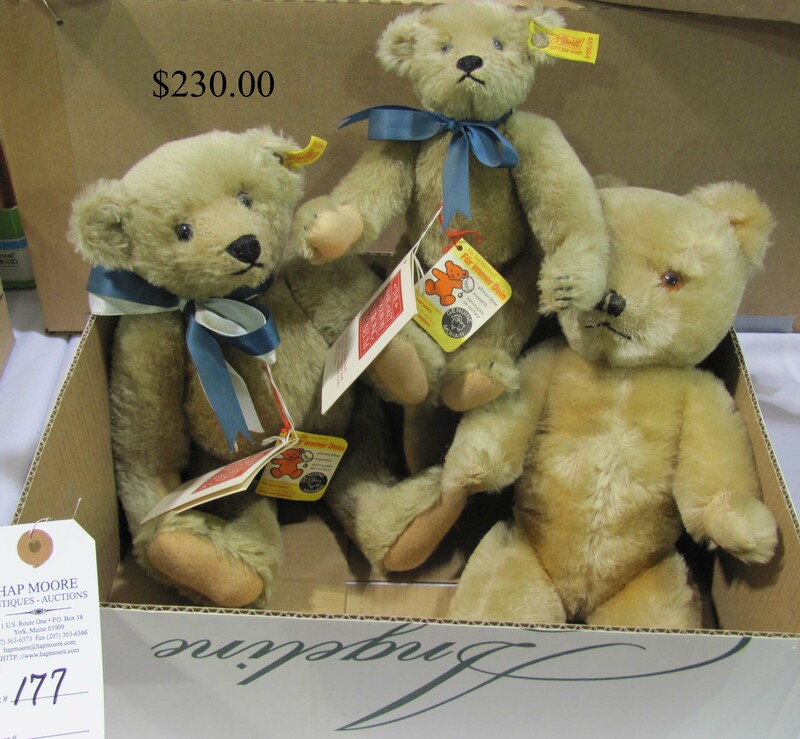 early Steiff Teddy bear and selection of Steiff and other animals, older and later forms (1, 2, 3, 4, 5, 6, 7). 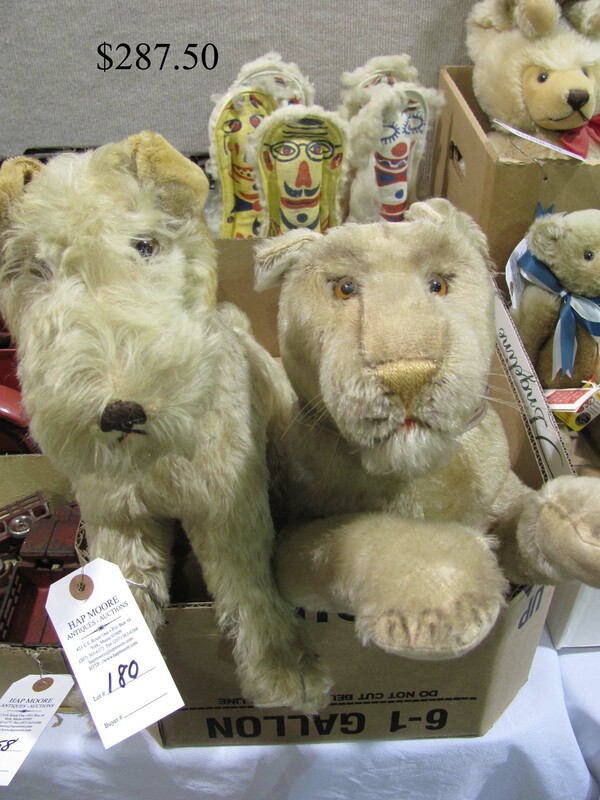 Collection of old carved and molded animals. 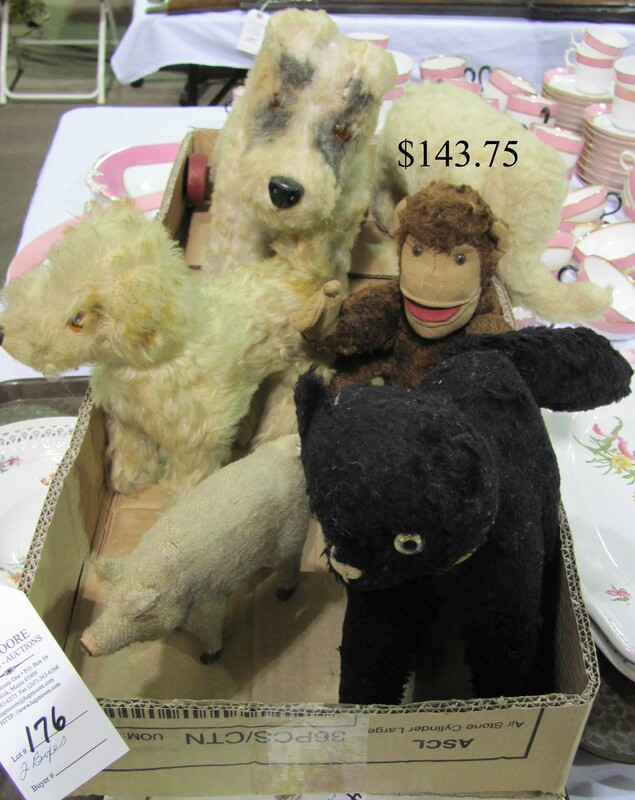 Small lot of small wooly sheep. 18 in. stuffed Mickey Mouse. Set of canvas and wool toy “knockdowns”. Small tin windups. Lot of toy tin and wood violins. 22 in. Simon & Halbig, miniatures and other dolls. 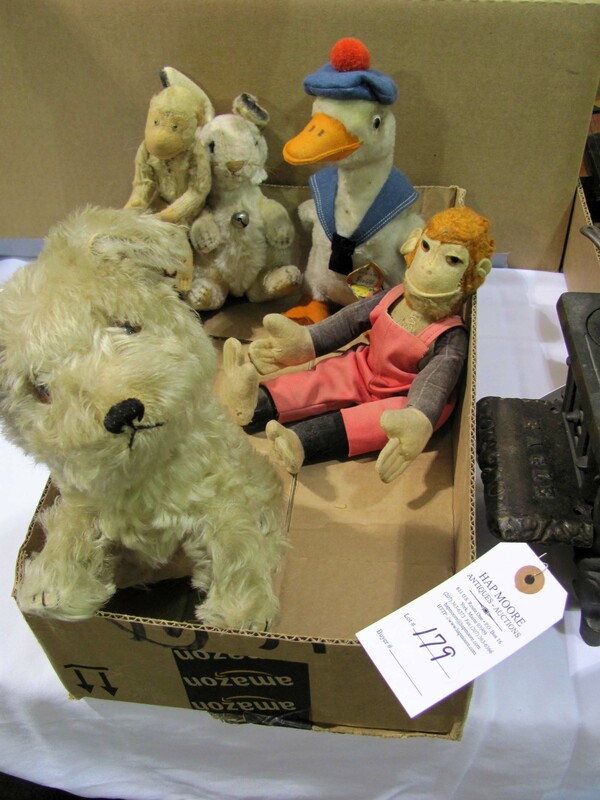 Skookum dolls. FOLK ART: 42 in. 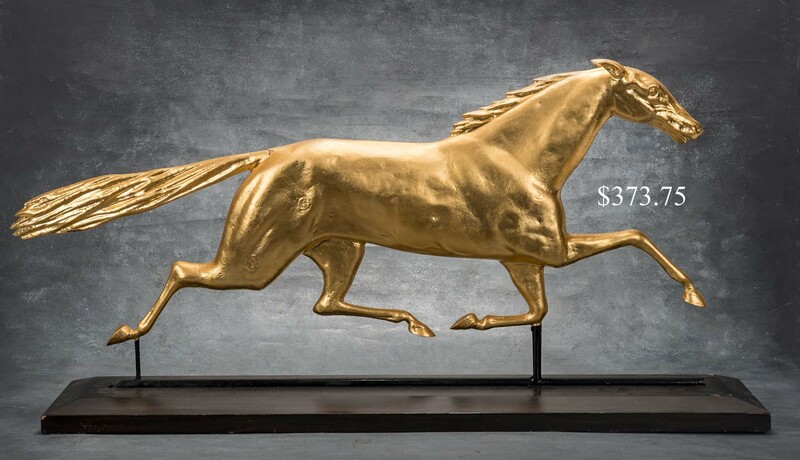 running horse weathervane. 20 ½ in. gamecock vane. 54 in. 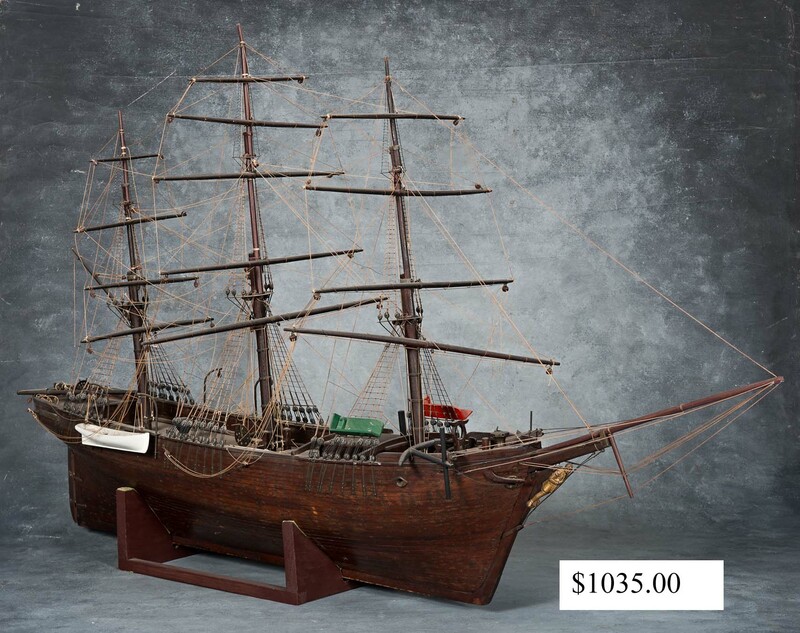 fully rigged model of the ship, William Lawton. 38 in. group of three carved and polychromed heads of putti. Post Office sign originating from West Townsend, MA. 42 in. Bonny Kneuk (Beautiful Place) sign, dated 1869 on the back. Decoys. 23 ½ X 22 in. graphic and colorful 1853 needlepoint sampler, depicting people, birds, animals, trees, flowers and ornaments, all surrounding a colonial home. 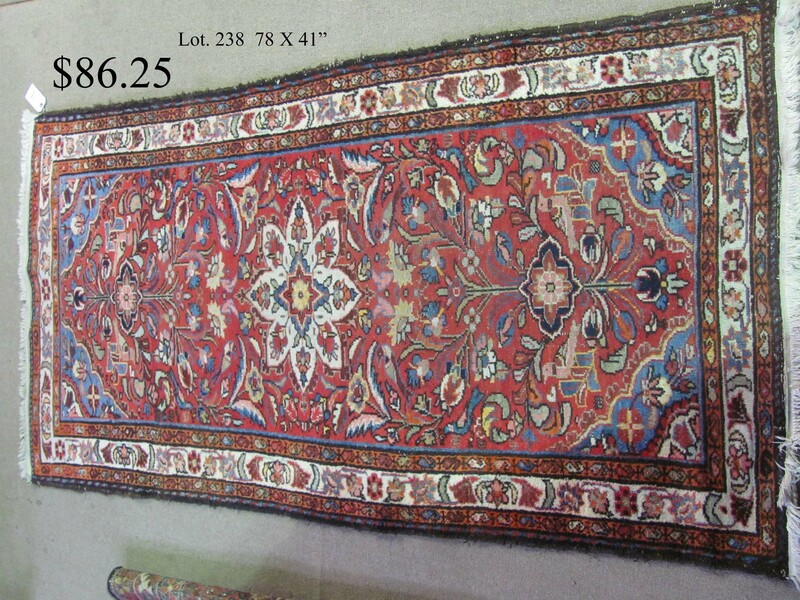 19th c. 55 X 77 in. 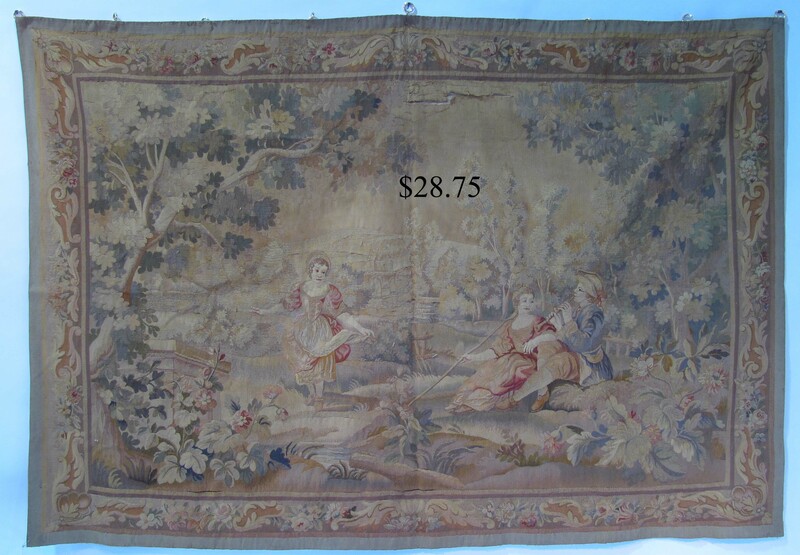 Continental genre needlework tapestry. Collection of German carved human figures. MISC. 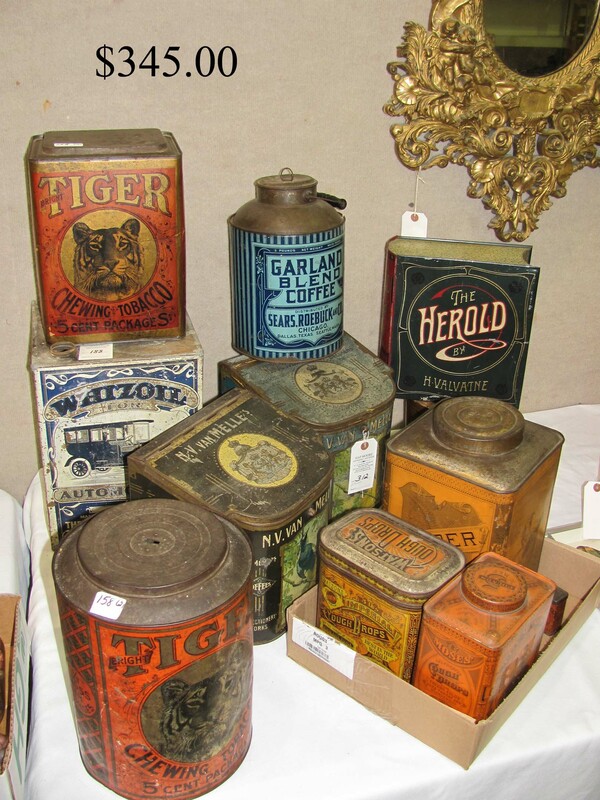 ACCESSORIES: Selection of graphic advertising tins, including coffee, spices, cough drops, chewing tobacco and motor oil. Small sel. 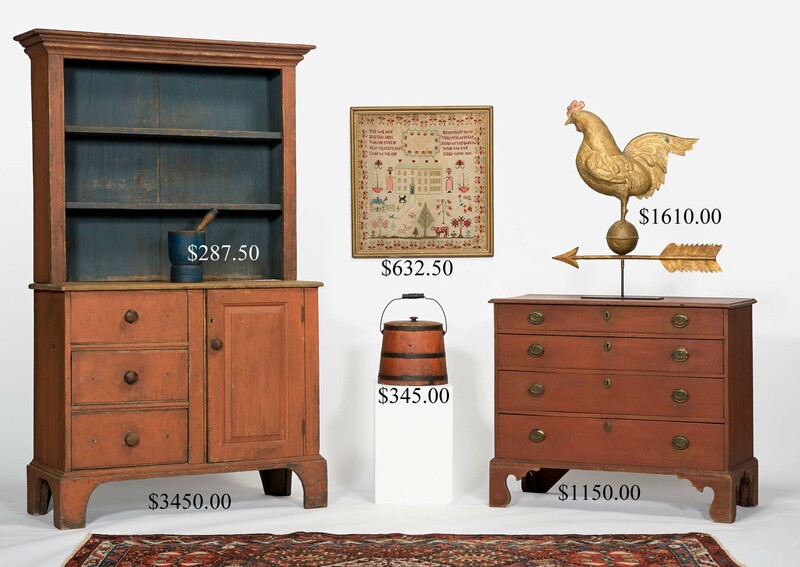 of vintage clothing, hats, 19th c. men’s boots, etc. Quilts and linens. Collection of handbells. 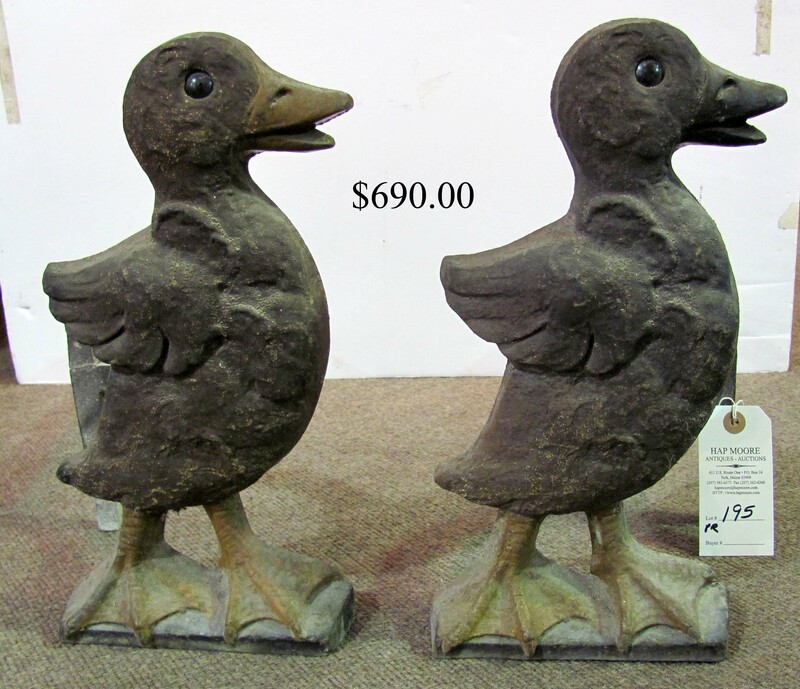 Hawes cast iron duck andirons. 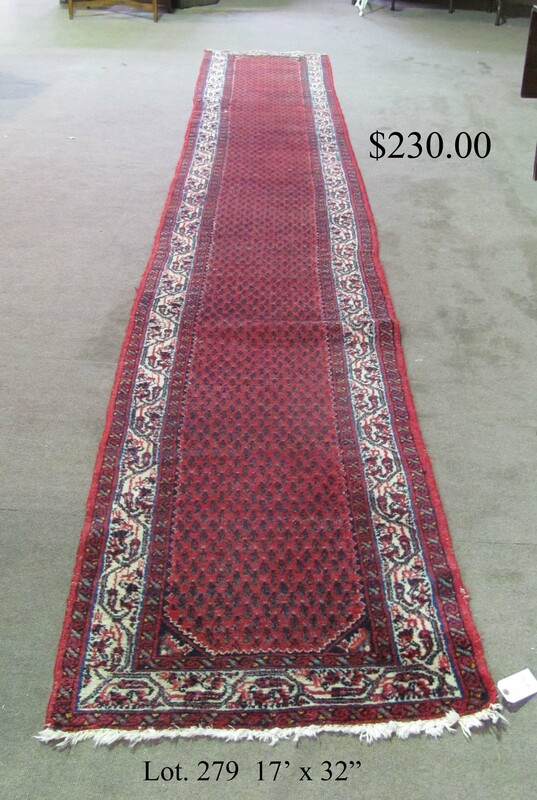 Selection of smaller and larger ORIENTAL RUGS (1, 2, 3,4). Lot of differing pairs of 19th c. epaulets. Lot of toy cannons. Old comics. 23 in. and 12 in. Enterprise coffee grinders. OLD FIREARMS: 1884 Springfield trap door 45/70 rifle. Stevens octagonal barrel tip-up rifle. Stevens long pistol. OLD MAPS AND PAPER: 23 in. early framed map: Stiria, Steyrmarck. 15 X 20 in. 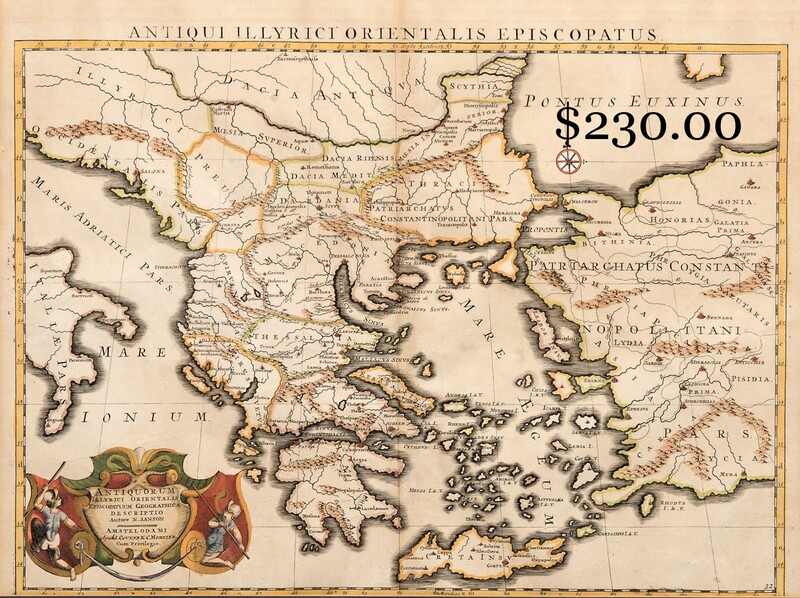 framed early map: Antiqui Illyrici Orientalis Episcopatus. From our Durham, NH Ffrost descendant, Framed account of fees for appointment of John Ffrost to His Majesty’s Council in NH with Henry Newman’s 1724 letter of congratulations. Samuel & Wm. Hale’s ledger of cargo on seven ships from 1795-1822, incl. from the port of Portsmouth. 1782 love letter from a Fenchman to newly introduced Nabby Frost of Portsmouth, NH. Other Ffrost paper. April 19, 1906 handwritten letter account of the San Francisco fire. Official office paper and memorabilia from the estate of Tip O’Neill’s secretary. JFK testimonial and memorial paper. Carter/Mondale Inauguration invitation. 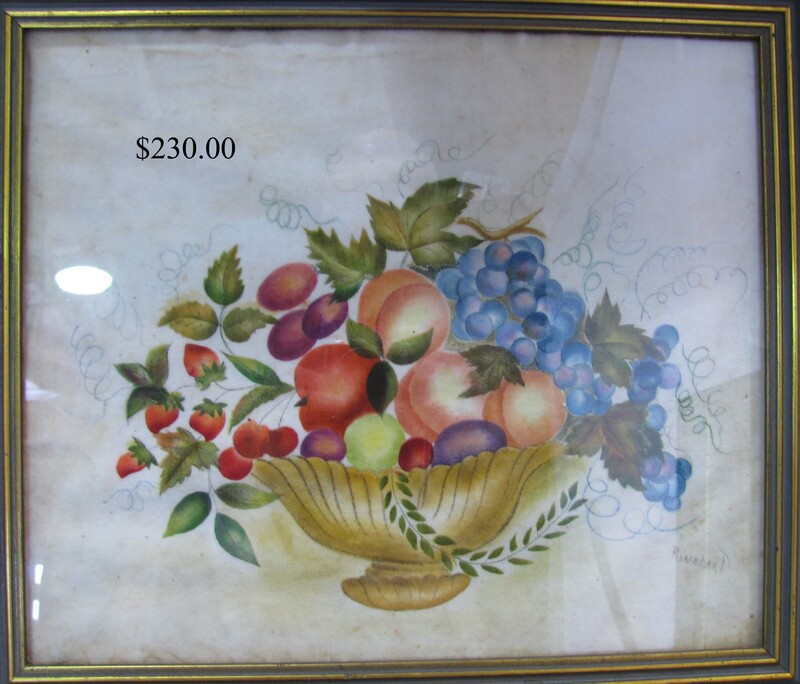 OLD PAINTINGS AND PRINTS: 19 in. sq. Phebe G. Field (Mrs. E. S. Field) still life oil of strawberries. 14 X 17 in. Rinehart signed theorem of fruit. 22 X 13 ½ in. 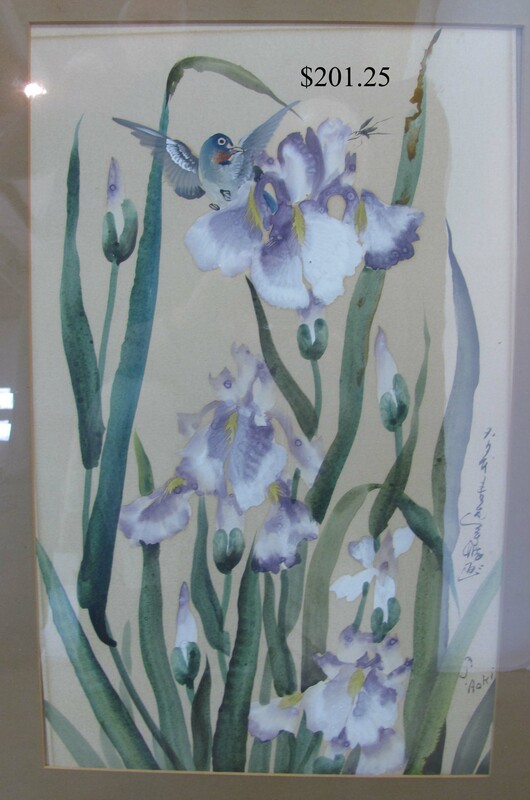 signed Asian w/c of irises. Unsigned interesting country landscape oils. 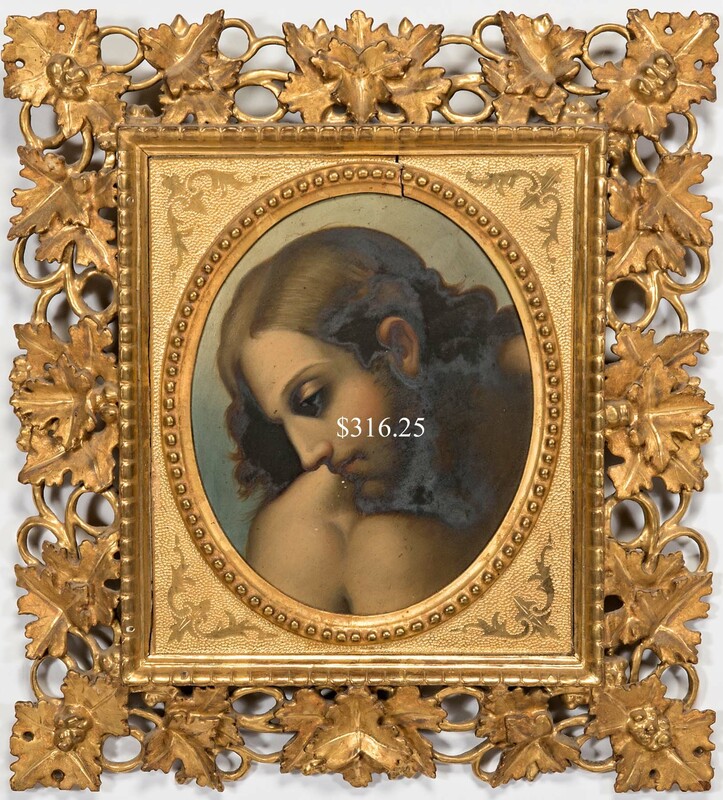 Florentine oval giltwood framed oil of Christ. 12 X 10 ½ Greek or Russian silver and wood religious icon. Framed 15 X 12 in. 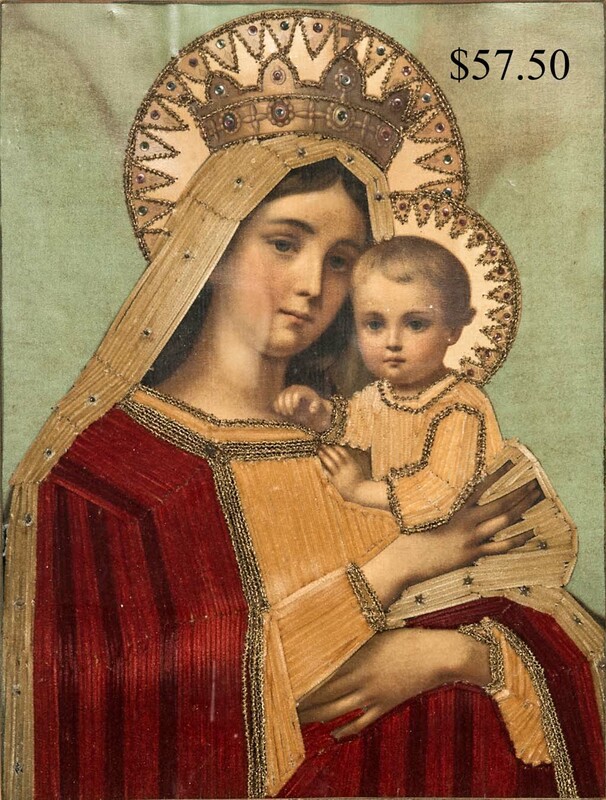 velvet and iconic paper image of Madonna and Child. Early gesso-framed 16 in. sq. oil of Madonna and saints. 9 X 22 in. Steven Trefonides w/c of male figures. 29 X 21 in. signed Japanese print of woman carding wool. 12 X 7 ½ in. Edmond Garrett illustration of musketeers. Bruno Mankowski watercolors and drawings of human figures. 24 X 21 Jean Cassice print, Barron Landscape. 1988 Leo Castelli Collection exhibition poster. Gould and Bowen bird prints. More of interest and quality. Refreshments and food available on Saturday Nov. 23rd. TERMS OF SALE: Cash or approved check. Mastercard and Visa accepted. 15% Buyer’s Premium. 5.5% ME Sales Tax applies to all purchases without copy of current resale exemption certificate. Written or oral descriptions subject to error or omission. 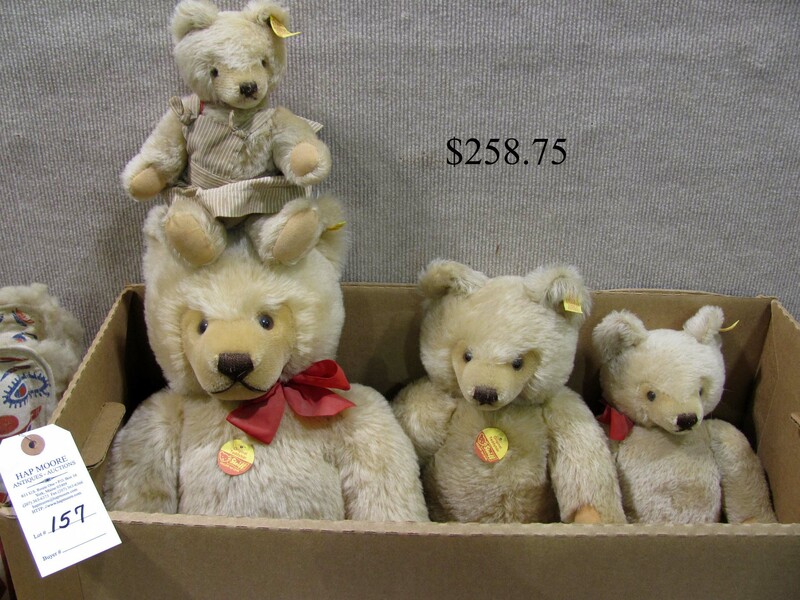 Coin, Currency and Stamp auction - Friday evening - close at 5:30 P.M.